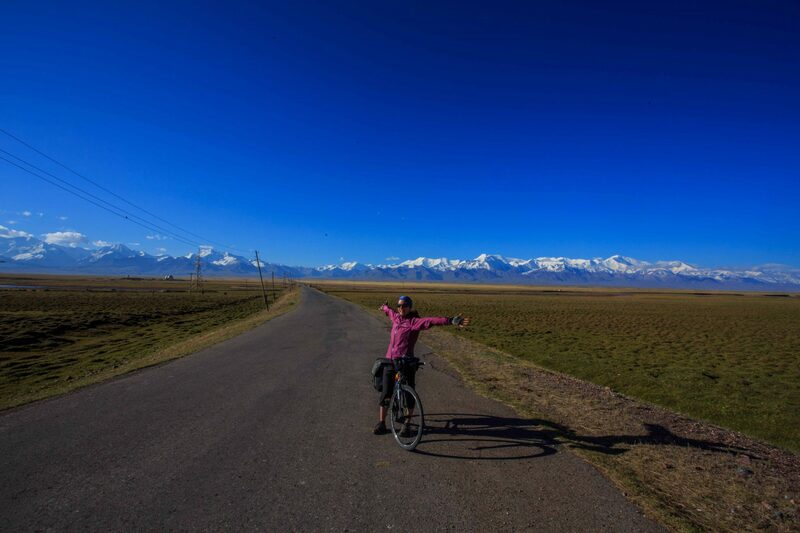 Sary Tash has a memorable name, but very few moustaches – in fact there’s very little of interest at all other than the jaw dropping mountain vista. We arrived in the evening blown away by the village’s location. 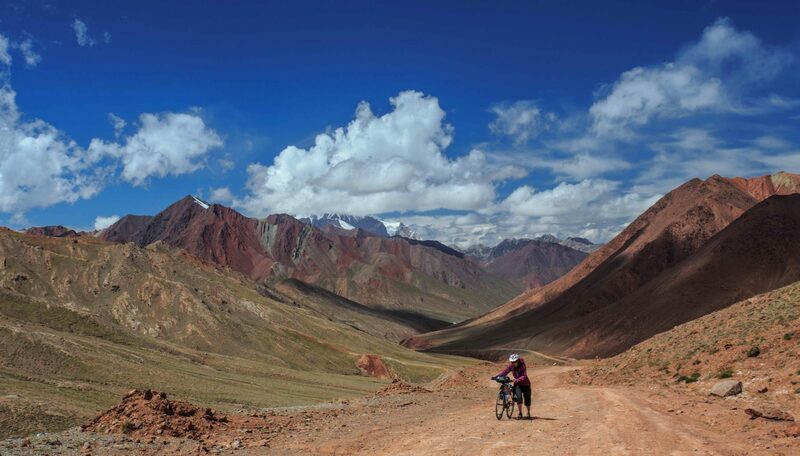 It sits above the vast steppe and yurt-dotted Alay valley, perfectly perched to give a vista of the vast snowy High Pamir mountains. In the evening this snowy horizon became bathed in mind bogglingly beautiful alpenglow. 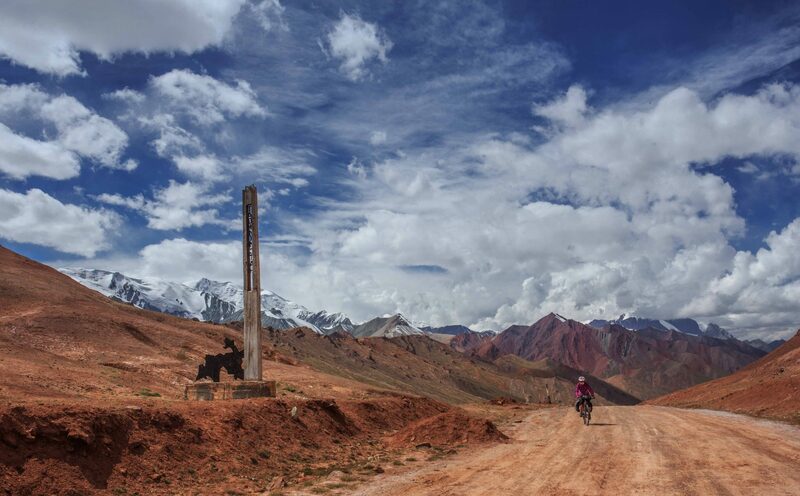 Directly opposite lie Peak Lenin and Independence Peak, both well over 7000m. The massif also contains the Fedchenko glacier: for geography geeks this is the largest non-polar glacier on the planet. Sary Tash was disappointing on first impressions, I felt like it let itself down and even the Chinese truckers must feel let down when they call by. However if you spend some time here the place has a certain frontier charm, after all it’s still a wild remote outpost that really only exists to service wintering nomads and a main road junction. 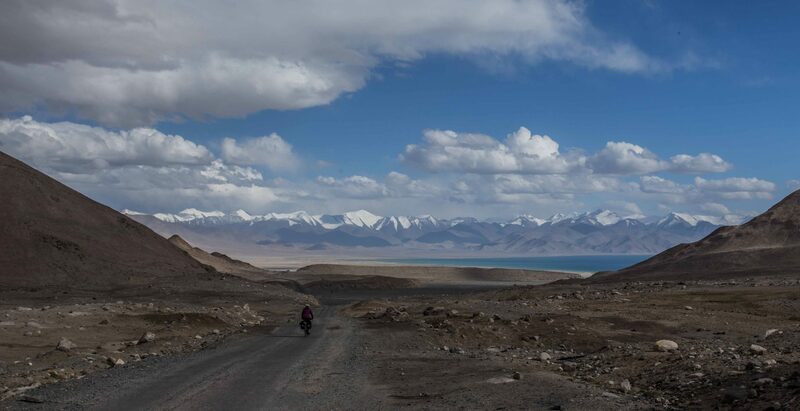 It’s where the M41 Pamir Highway joins the highway to China that crosses Irkestam Pass, a road busy with coal trucks. 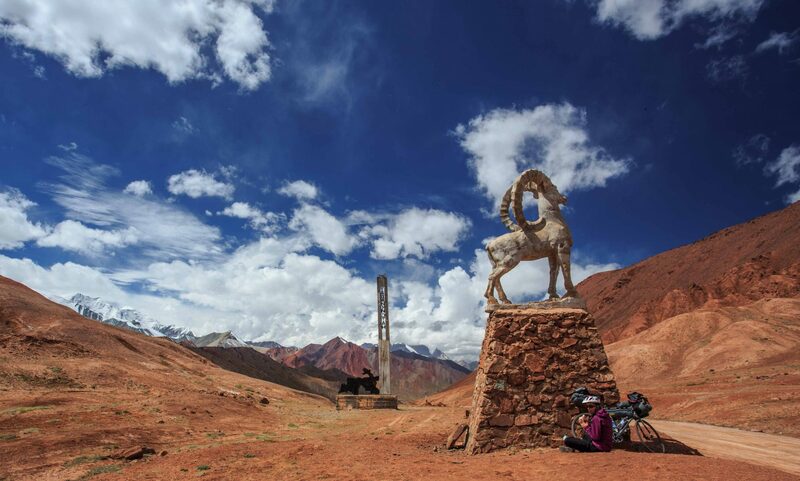 It’s no surprise really that it’s rough around the edges, but if it were more accessible and developed then it would surely have crowds of tourists just sitting in awe of the views and not just goats. We stayed at the smart looking pink house hotel, which was in no way a hotel. The family living there were friendly though, especially the grandfather who was super smiley and friendly, helping with the bikes; he also liked going for drives in his old smart looking soviet sedan. Sometimes chauffeured by his 9 year old grandson. Like most houses here it had the small yard for animals, one side loaded up with hay and piles of dried yak dung for burning as winter heating fuel, then at one end was the hole in the ground with a plank of wood over for toilet facilities. Our ‘room had a platform with comfy bedding and the food was easily edible if not the freshest we ate. Noodle soup for breakfast and egg and plov for dinner with dry old bread. We were shattered from the previous day’s long ride so we decided to spend the day in Sary Tash because we needed some time to acclimatise. 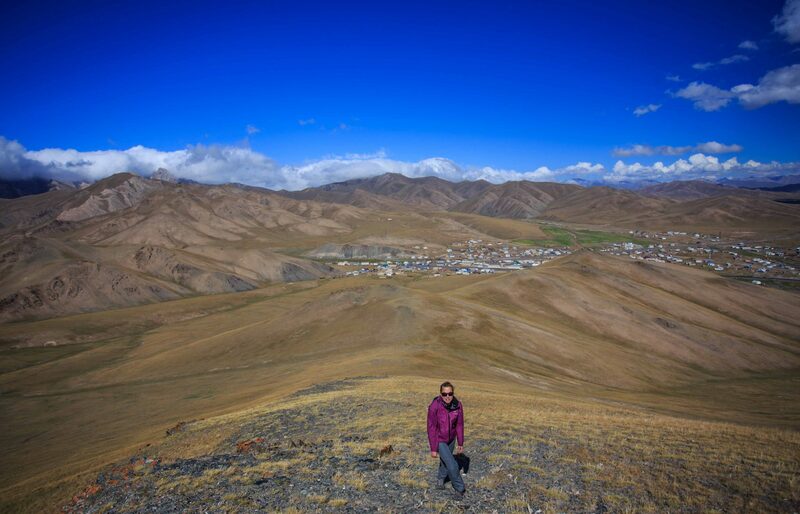 At 3150m, Sary Tash was the only town under 3900m we would stay in for the next week, with 4 passes over 4300m added to the equation. We spent a day observing the village life go by from a comfy bench in the sun – it was all very interesting. We also went for a hike along the clearly defined ridge starting on the edge of town. Sary Tash also has a well-stocked shop (well when we visited it was), albeit with very sporadic opening hours. Fresh veg, melons, eggs, bread and the standard dry goods meant a decent selection. 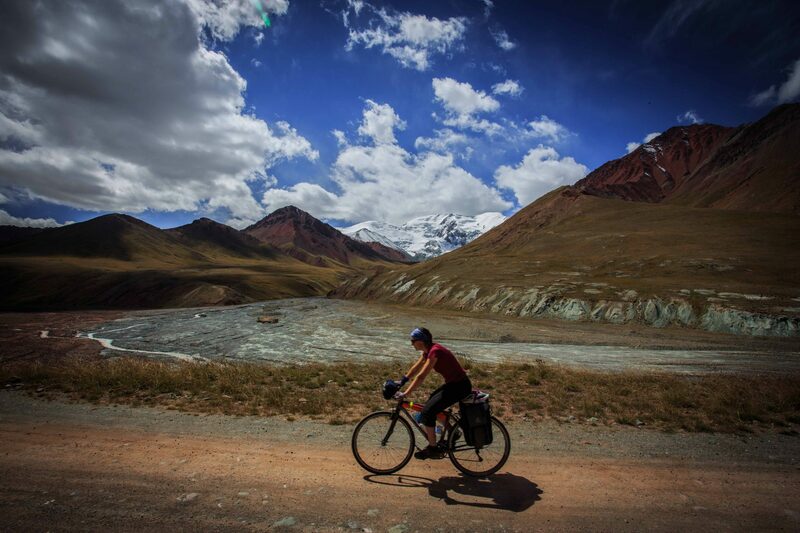 We bought four days’ worth of food to be sure we had spare before we reached Murghab in Tajikistan. It turned out Karakol village en route had shops but we weren’t sure. The next day things picked up even more in the scenery stakes. I wasn’t quite prepared for what lay in store. With bags stuffed full of pasta and soups we headed across the vast Alay valley plain, stopping for photos before being treated to a close-up display from two kinds of eagle and later three fighting buzzards. 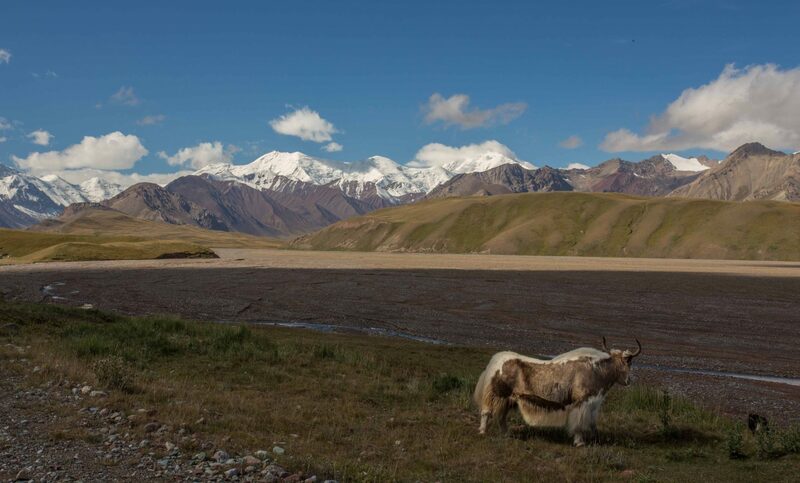 The plain was about 20km across and we spotted herds of yak and goats being cared for by the inhabitants of the many yurts. A nomad’s kid on a horse rode over and asked for a Snickers bar – I explained that sadly I had no Snickers and given what lay in store I was sadly intent on keep all confectionery items for the time being. He didn’t speak English. 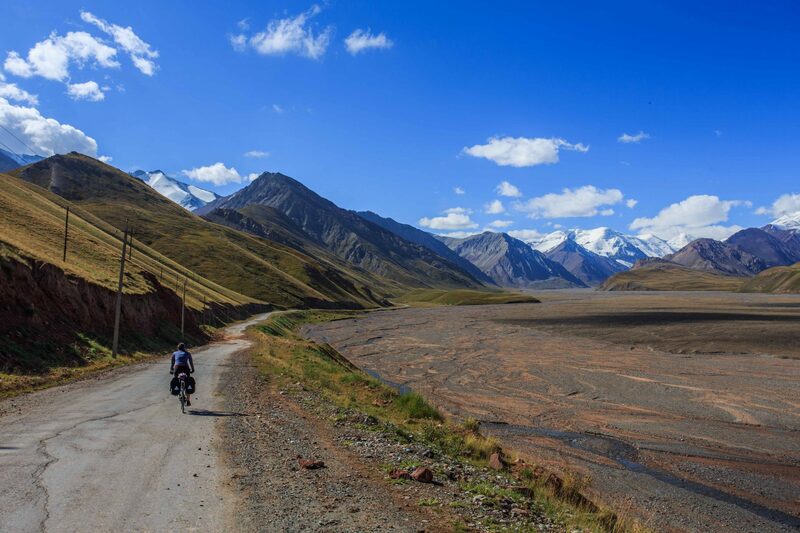 The road was smooth and paved until the Kyrgyzstan border point. From there on it deteriorated for the 20km across no-man’s land. 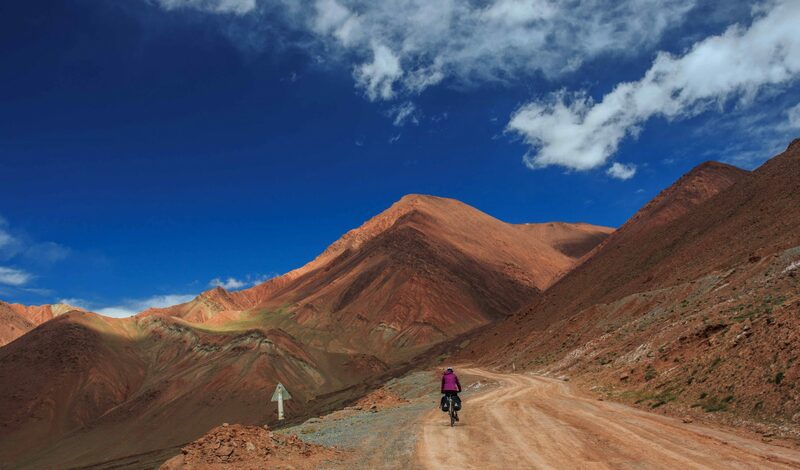 The climb was 1300m of ascent, but it went from 3000m up to 4300m so pretty intense at these altitudes. We briefly rode with a Dutch couple but like everyone else they had a ridiculous amount of stuff and struggled to keep with our lightweight uphill pace, instead being loaded down with laptops, kitchen sinks etc. The border crossing to leave Kyrgyzstan was easy, as expected, just a small booth and a quick stamp, before being bade well on our trip. The initial view was changing as we got closer to the heart of the mountains. The rock surrounding us turned a fascinating variety of red, orange and grey colours. This Martian red rock and dirt was tainted white by salt from evaporation that the intense sun and low precipitation exaggerate. The altitude and dry air caused me to suffer a bad nosebleed, I had to sit down and get my heart rate down from the climbing at altitude before it finally stopped and we carried on uphill, nostrils stuffed with tissue. Nosebleeds are always a bit disconcerting but I am used to them as dry high altitudes seem to cause them for me. On we spun and we slowly gained metres. A small house lived in by road workers appeared ahead and a small girl appeared – she seemed to want only a high five or handshake from Marion which was a random experience in such wild place. 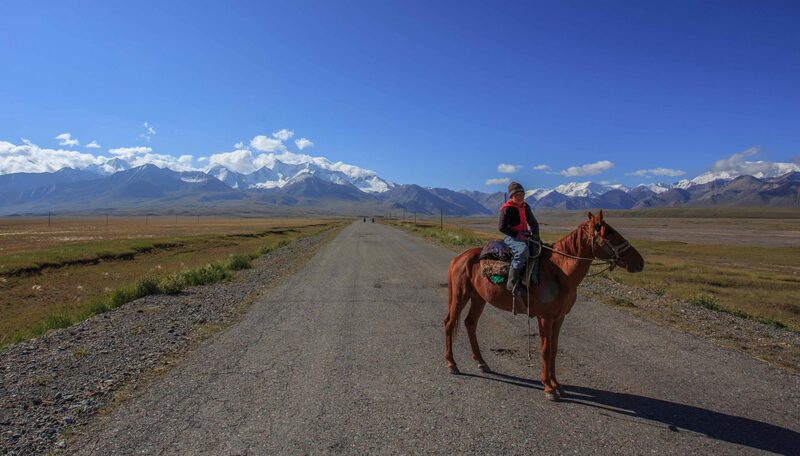 The only other locals we met were border guards mounted on horses with AK47s slung over their shoulder; a good form of transport in these rugged landscapes. There’s a certain distrust between both border staff with the occasional shoot-out, despite the populations being so friendly and peaceful. The final few hairpins up to the pass appeared and we had to reach the top before we saw the actual border, marked by a large Marco Polo sheep and two signs with maps of the respective countries attached. We sat down to eat our Snickers (sorry nomad kid, I might have lied) and drink and take it the view from the pass; it was like being on Mars only more interesting and slightly more oxygen. The Tajik border was just down the other side and we reached it quickly. We were both nervous having heard various ploys the border guards use to confiscate stuff and charge money for made up penalties. At the first hut our passports were stamped, then a chap in a tin hut sprayed our bikes with a yellow disinfectant and charged us a few dollars. Then it was just the dark smoke-filled hut by the barrier that stood in our way. Outside some French guys in a 2CV were waiting anxiously expecting a bribe to be required but they weren’t sure how big. We handed our passports over and they just laughed a shiny gold toothy laugh – not the best start – but a few minutes later we were free to go; people with cars were easier targets for them it seemed, as we said “bon voyage” and made our escape. 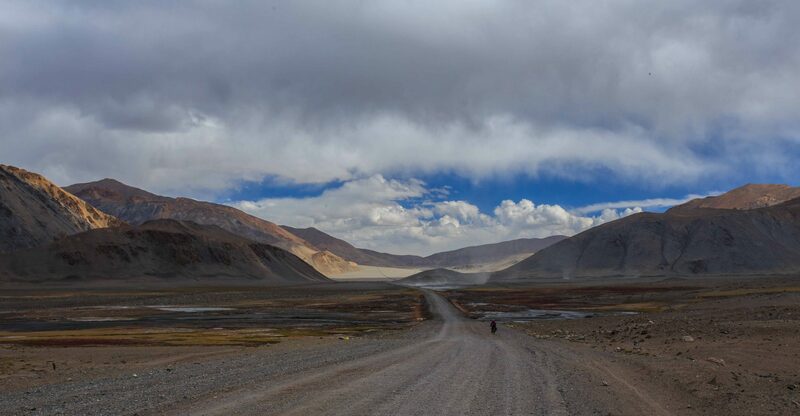 The landscape was now a wide open plateau at 4000m, stained by salt and decorated by perimeter mountains of varying colours, heights and snowiness. It also had a constant border fence alongside marking the 20km land grab by the Chinese following a ‘negotiation’ in 2011. The road became very straight, by which I mean no corners for several kilometers each time. There was very little vegetation, just mythical golden marmots for company whistling as we approached them. It was certainly now more lunar than Martian. As we progressed, the atmosphere became bleaker and even less hospitable. It really felt like an area you didn’t want to stick around longer than it took to soak up the ambiance, it’s just so wild and exposed cycling here. The high UV in the sunlight up here caused my skin to blister where sun block had missed somewhere. Then the wind started drawing up tornadoes of dust, before it formed a sheer wall that stayed on our backs like a finale curtain for the rest of the afternoon. 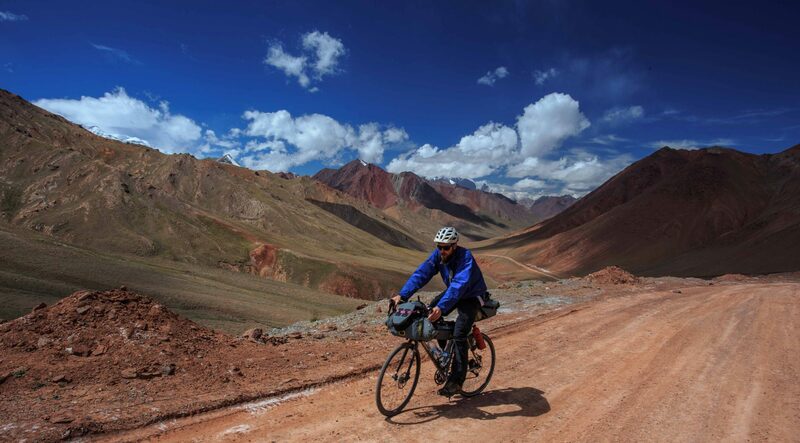 A final pass required all our effort to conquer before we were blasting with a tail wind towards the majestic Karakol lake. 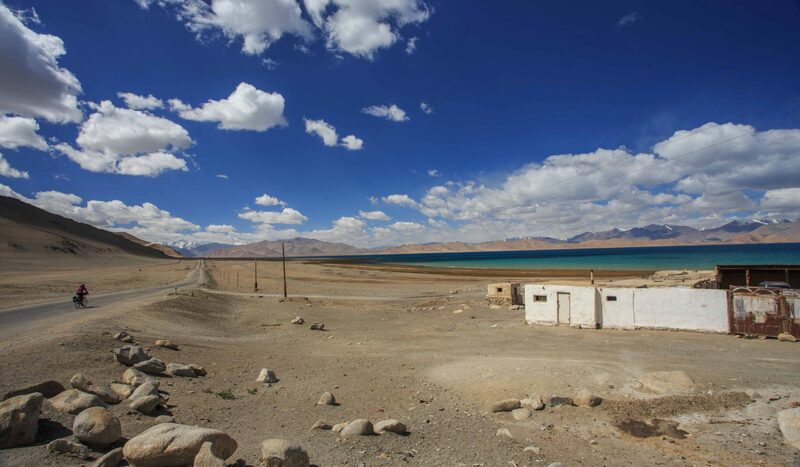 Formed in the plateau by a meteorite strike many years ago, it has no outflow and is a salt water lake of unbelievable blue colour, ringed by snow capped peaks and an arid desert. It’s without doubt one of the most striking, truly epic wild locations on the planet. As the lake came into view we stood in awe before cruising along looking for a good camping spot. I think we found a good one, a sheltered spot in the evening sun with a great view over the lake. 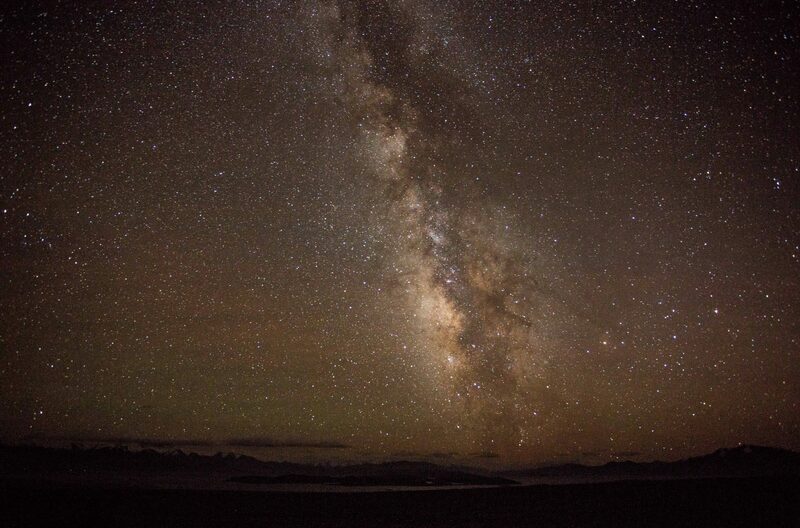 The night sky was well worth braving the freezing temperatures for – and boy were they freezing up here! The nearest artificial lights were behind a mountain range and 100s of kms away and the nearest big town was probably Osh, 400km away! We couldn’t believe how quiet the road was, literally 5 or 6 cars a day passed us. All were 4×4 taxis as the washed-out rivers restrict the road to high clearance vehicles or bicycles! 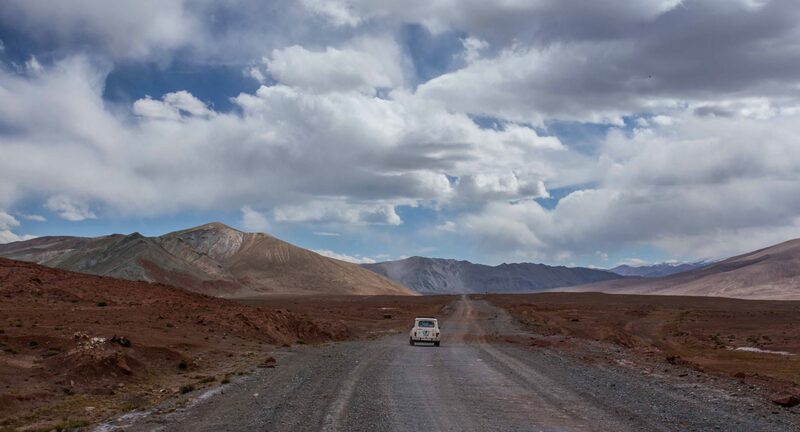 This stretch of the Pamir highway is the highest and the quietest. It’s what earns the road it’s remarkable reputation as one of the greatest cycle rides in the world. 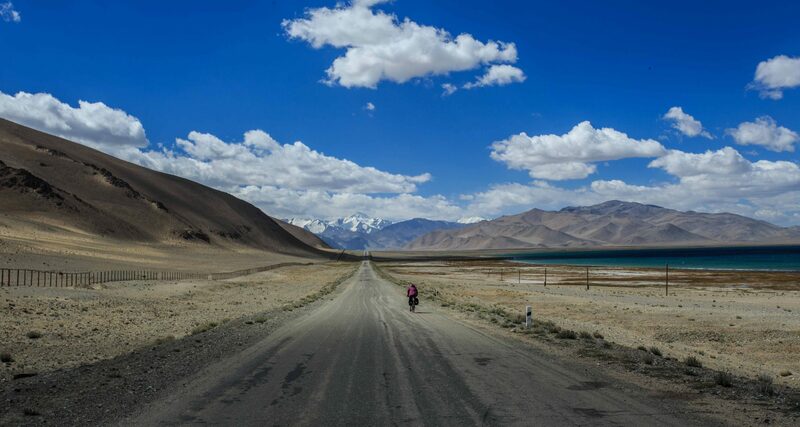 Karakol lake is probably the jewel in the crown. Next stop would be Mugharb, a few days cycling away still. 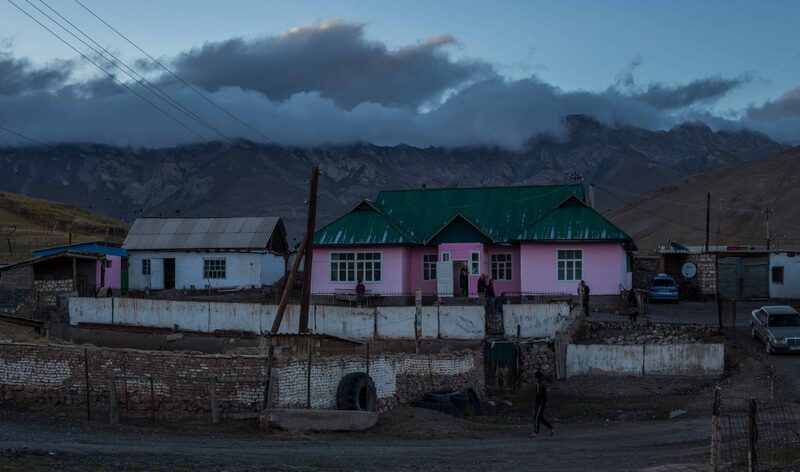 In the mean time we called into Karakul Village, noting lots of ‘Homestay’ signs that would be warmer than our tent no doubt. A collection of small mud houses, there was a well-stocked shop with eggs and veg but resources here were so limited it required much effort to find (no signs) and then to get a local to open it for us. 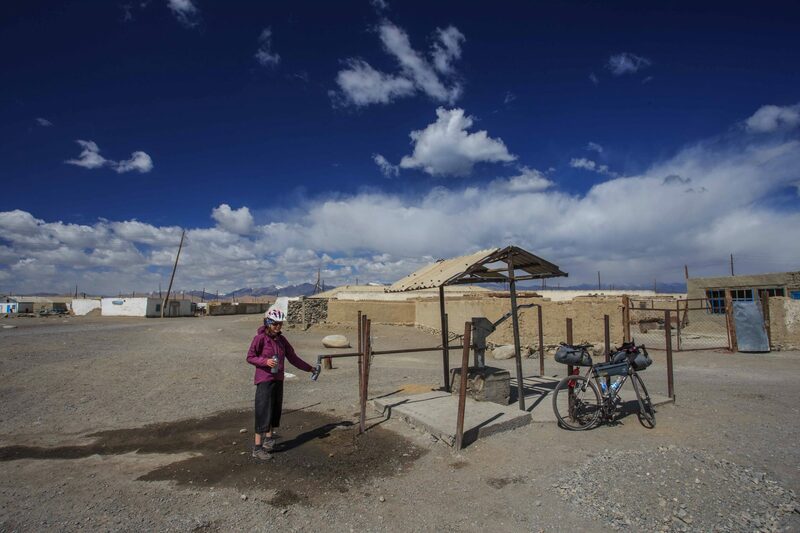 With Karakul being a salty lake in the desert a deep well was required to get water in this remarkable place to live. We filled up bottles, chatted to some soldiers and admired the view before getting on the road again. 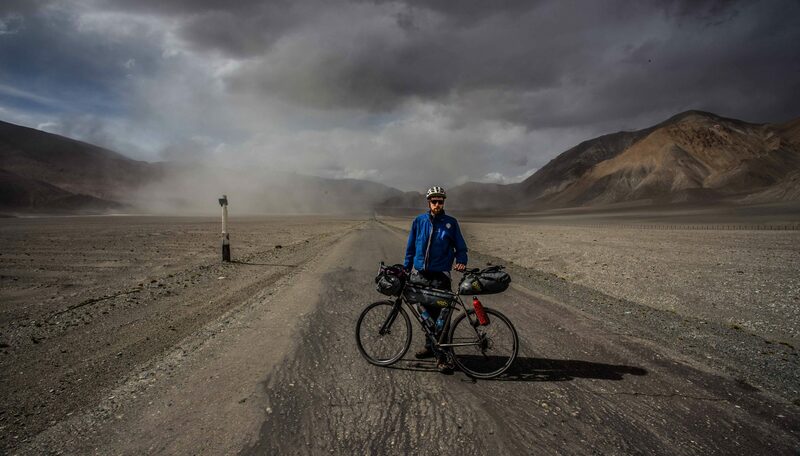 A crazy headwind made for a tough day, but progress towards Murghab was clocking up.